Enjoy a full immersion Tour of Northern Italy Lakes, the most renowed ones of Italy! Appreciate the sophisticated atmosphere of the Lake District: relax in Bellagio - the wonderful town that shines at the centre of Lake Como, against the backdrop of the Alps - and in Stresa, the Pearl of the Lake Maggiore in a VIP Luxury Small Group Tour (6 to 14 participants). This VIP Luxury Small Group Tour will allow you to discover in a more intimate way Northern Italy: Lake Maggiore, Lake Como, Lake Garda, Padua, Verona, Milan. Discover Lake Como ,second-home of international celebrities and all kinds of beautiful people, in Lake Maggiore sail and walk through the precious architecture of the Borromean Islands with their stunning palaces and gardens. Live the experience of the Lake Maggiore Express & Centovalli Train for one of Switzerland/Italy's most scenic journeys. Explore Lake Garda, Italy's biggest lake and the sorroundings. Admire Palladio's Villas in Padua and stroll through Romeo & Juliet's city (Verona). Admire the Last Supper by Leonardo in MIlan and have a walk trought Navigli neighborhood. 14 Nights accommodation in exclusive and fascinating 4 sup./5 stars Hotels or historical mansions, with full buffet breakfasts: 3 Nights in Lake Maggiore, 2 Night in Lake Como, 3 Nights in Lake Garda, 2 Nights in Padua, 2 Nights in Verona, 2 Nights in Milan. 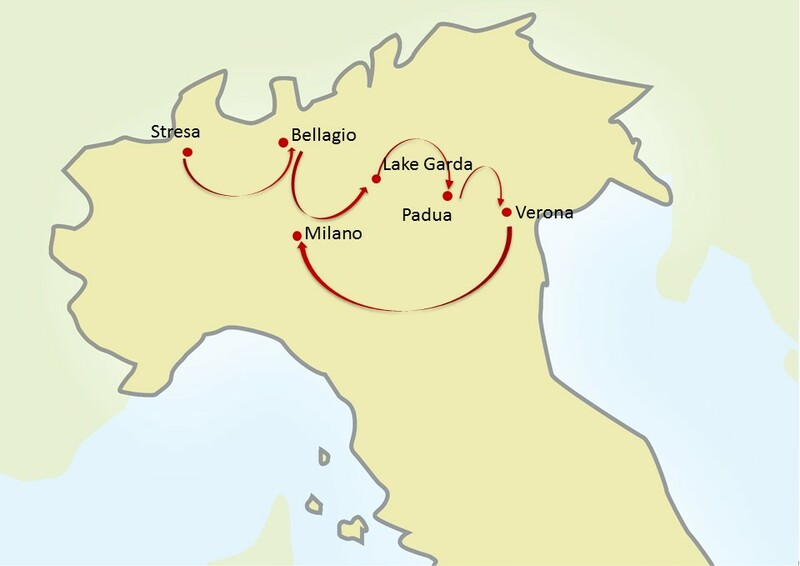 Full Day excursion Centovalli Train and Lake Maggiore Express. Private Boat Tour on Lake Maggiore to visit the Borromean Islands with private English speaking guide (entrance tickets to the Villas included). Private boat tour on Lake Como and on Lake Garda with private English speaking guide. Private sightseeing Tours with expert local English speaking guides in Padua – Verona (Arena) – Milan (Last Supper); including all the entrance fees to the sites visited avoiding long waiting lines. Private Guided Tour of a Franciacorta Winery with wine tastings and tasting menu in a typical restaurant (beverages not included). Private guided tour and entrance tickets for the Palladian Villas: Villa La Rotonda and Villa Valmarana. Half day excursion to Valpolicella wine country and Valpolicella Winery visit & tasting. High speed 1st class train Verona to Milan. The tour begins and ends in Milan. Relax in Stresa, the elegant internationally famous holiday resort known as the Pearl of the Lake. Private Borromean Islands Boat Tour to discover the three main islands of the lake. You will first visit Isola Bella, the most famous one, with its “Palazzo” and gardens; then Isola dei Pescatori with its simple quaint houses lining the cobbled lanes and the fishing boats bobbing along gently in the harbor, the delightful Chiesa di San Vittore, whose bell tower dominates the skyline is worth a visit for its 17th century paintings and last Isola Madre, with its beautiful Botanical Garden and all species of pheasants, white peacocks and parrots living freely and the 18th century Palazzo Borromeo, a palace of rare beauty. Full Day trip on board by narrow gauge train and ferry. With the Lake Maggiore Express ferry boat you will cruise up to Locarno, Switzerland, the northern tip of Lake Maggiore. Then, you will board the picturesque Centovalli train for one of Switzerland/Italy's most scenic journeys. The little train reaches many bridges and viaducts that span the valleys. Enjoy spectacular views and stop off in the rustic villages that the train passes through. Afternoon at your own leisure to visit the beautiful Lake Como. Full day excursion of Lake Como and Boat Tour of the lake by a comfortable private water taxi to get a close view of all beautiful villas built along its banks. Enjoy Bellagio with its century-old buildings, stone lanes and picturesque cobbled stairways: the perfect place to soak up the lake's famous panorama. Along the way, stop for a pleasant visit in a Franciacorta Winery with wine tastings. Franciacorta is famous for its high-quality sparkling wines. A full tasting of bubbles will follow. Day at your leisure to explore Lake Garda: we suggest a visit to the lovely Salo’: traces of its prestigious past can be seen along the main street in the elegant historic center full of buildings with great historical and artistic value, and also with many boutiques and stores. Full day private boat tour: you will sail in direction Gardone Riviera and Fasano, then you will see Villa Bettoni and its gardens and the important Villa Feltrinelli facing the lake. Explor the beautiful 16th century Palladian villas : Villa La Rotonda (build on a project by Andrea Palladio for bishop Paolo Almerico, around 1570) and Villa Valmarana (classical example of a countryside dwelling, was built on behalf of the jurisconsult Gian Maria Bertolo in 1669). Verona is especially renowned for the legendary story of Romeo & Juliet, which inspired William Shakespeare to write one of his masterpieces. the city, covering Romeo's and Juliet's House, the Roman Arena, the Ancient Casle, lovely squares and dramatic landscapes. Visit one of the beautiful Valpolicella Winery estates and have a tasting of Amarone wine with appetizers. Rest of the day at your leisure. Free time to enjoy Milan: take a walk in the lively Navigli area trought Corso di Porta Ticinese, Colonne di San Lorenzo and the Basilica of Sant'Eustorgio. Your Guide will show you the city highlights: the Duomo Cathedral, Galleria Vittorio Emanuele, Piazza della Scala, the Castello Sforzesco, including the Cenacolo where you will admire the “Last Supper” by Leonardo.